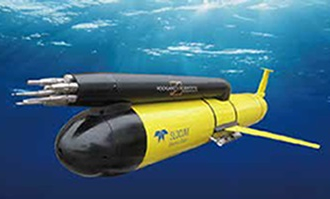 Glider “Teresa” is an autonomous underwater vehicle free of propulsion, operating along vertical sections to monitor the water column up to 1000 deep by up-and-down sawtooth-like cycles called yo. It moves both horizontally and vertically only thanks to density variations (floating and sinking) and center of mass displacement (inclination). Equipped with CTD probe, dissolved oxygen and fine-structure sensors, it moves through the water column recording vertical profiles of hydrological properties and turbulence. Its vertical movement is particularly favorable for turbulence measurements. The fast-response shear probes and thermistors allow the glider to obtain turbulence measurements from two independent methods on the same platform. The fast-response shear probes and thermistors allow the glider to obtain turbulence measurements from two independent methods on the same platform. During the mission, data can be transmitted via satellite to data center, when the glider comes to the surface for positioning. “Teresa”, as most of the Glider vehicle, is modular, allowing for rapid sensor reconfiguration to respond to emergency conditions. The glider has been acquired in 2014 through CNR-DCSPI funds as part of the EUROFLEEETS Project (FP7-2009/2013, coordination: IFREMER). CNR was partner represented by ISMAR - UOS of Lerici (SP), with the involvement of ISAC - UOS of Rome.